What a fun, inexpensive, unique Easter centerpiece for our little cabin table. Another idea inspired by Martha Stewart. The basket, eggs and burlap I had on hand already. I couldn't find a faux chocolate bunny online anywhere so I was going to order a candy mold to make it with clay. Luckily I stumbled across this one at Hobby Lobby for $2. You can't beat that price, so the candy mold idea was happily scratched. All I needed now was clover, so off to the garden nursery. They didn't have any :( ,oh well, I purchased two pretty ivy plants for $4 each and came home to assemble everything. First I cut a strip of burlap fabric to line the open basket. Then placed the ivy plants in the basket and arranged the vines to fill the basket evenly. Next, I cut a few short pieces of heavy gauge wire and inserted one end of each piece of wire into a few green and cream colored eggs along with the chocolate bunny. Then I just stuck the exposed end of the wires on the eggs and the bunny into the dirt to finish the arrangement. For a total of $10 and a little bit of time, we'll have a pretty centerpiece until Easter. I really love how this turned out and I love that it is a neutral pallette. Let me know what you think of my version. Honestly, I like yours better! Found you via Centsational Girl's Spring party. I agree, I prefer Adina's better. I'm searching for the perfect items to re-create your version! Thank you Gesele. I hope you find everything you need to make one! Dana - Thank you so much for the compliment and the pin. You made my day! I love it! I like yours better too because it is a bit lower so you can see across it when it is on the table. Martha's looks a bit high for a centrepiece. Good job on finding the bunny for such a good price. Thank you so much. I've since figured out you can spray paint a thrift store bunny brown and pretty much get the same thing, if you can find a bunny in the right shape. I love it! I like how you used ivy in the centerpiece and I also like yours better than Martha's. Great job! I'm your newest follower. Would love to have you do the same. Come on over and check my blog out. Joy - Thank you for your compliment. I'm excited to add a few new followers to my blog. I'm learning along the way. I'm headed over to your blog now. 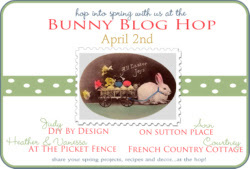 I am featuring your Easter basket on my site! I borrowed 1 pic & linked back to you. I hope that is fine.If you drop by enter the giveaway when your there!You can grab a featured button from my side bar if you like! 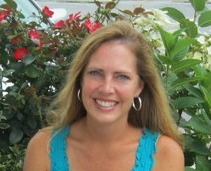 This is adorable-I'm your newest follower from Kates party-stop by for a visit! Thank you so much. I'll be stopping by Kates party-stop! Sounds like a fun site. Mariaelena - Thank you and welcome. I'll be stopping by for a visit. I looooove your version of Martha's basket. It's too sweet...and I might have to head out to get supplies to make my own this morning. Thank you! I would love to see your version if you make one! This is absolutely beautiful! It looks way more expensive too! So glad you joined our linky party with this craft and hope you'll be back with more on Tuesday and too see if you were featured! I have the perfect basket, and I'm totally going to do this!! Thanks for sharing at Simply Klassic! To answer your question about the button, you copy the code below the button on my page (click inside the box, then Ctrl-A to select it), right click to copy. Open your post, and go to html mode (you'll see options "html" and "compose") Scroll to where you want the button to go and paste it in. I was going to email, but your email is not linked. Megan - Thank you for your compliment! 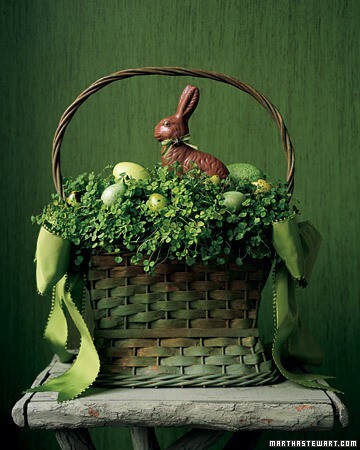 Love your chocolate bunny centerpiece! I just found you because of it, and I'm a new follower. As soon as I saw yours, I knew the inspiration was the Martha Stewart one that I saw last year. It's my favorite too and your version turned out so lovely. This is so adorable. I have been invited out to a couple of dinners for Easter; something like this would be nicer than a bunch of flowers. It turned out beautiful. I found you on Crafting Rebellion and I am a new follower. Come by and visit. Happy Easter. Love, love, love it! One of my favorite things I've seen posted! Like it a LOT! So pretty! I have most of the materials, so this will be a perfect project for Spring! Thanks..Found you on Pinterest. Gonna give it a try...so pretty! Prettier than Martha's! I think I will do something similar too...I have most of the materials all ready! Thanks for the inspiration! Thank you Cecilia! I'm thinking I might make a different version this year. Love the Bunny. Can't find it on Hobby Lobby website. The closest store is an hour away. Any suggestions? Hi Patti, thank you so much for the compliment. I could absolutely get lost in Hobby Lobby for hours. Thanks for stopping by. Adina, I am not familiar with Martha's version and don't need to be, your basket is lovely. You have inspired me to get a basket out of hiding (10 years) and re-purpose it! Thank you. Question: what type of eggs did you use and where did you find them. I am fortunate to live within 6 miles of a Hobby Lobby. Happy Easter! He Is Risen! Hi Sally, indeed He is Risen! I'm so glad the basket inspired you. I actually used eggs from a am Easter wreath I bought at a flea market. It was missing a few eggs so it was cheap. You can probably get eggs from a craft store that have floral picks and they would be easy to just push the picks into the plant dirt where you want them. I run Flowerups.com. I love this article. I am writing an article featuring Easter planters. Could I have permission to use a photo from this article and have the photo link back to your article? Yes, that would be just fine if you used my photo and liked back to my blog. Thank you!